Did you know that 75% of employees have stolen at least once from their employer? 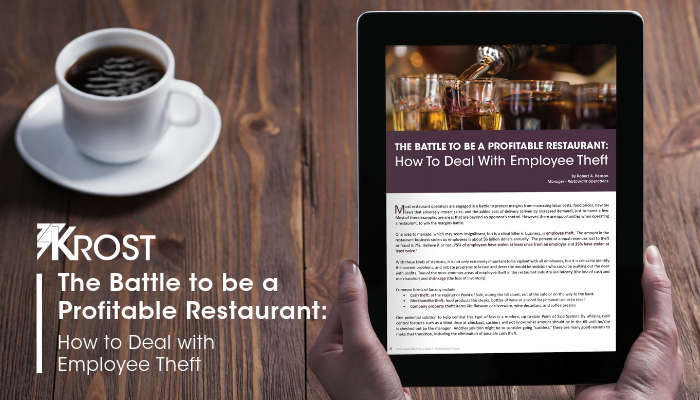 Learn more in the new article "The Battle to be a Profitable Restaurant: How to Deal with Employee Theft" by Robert A. Benson, Manager - Restaurant Operations that appears in the newest issue of KROST Quarterly. "Most restaurant operators are engaged in a battle to protect margins from increasing labor costs, food prices, new tax laws that adversely impact sales, and the added cost of delivery (driven by increased demand), just to name a few. Most of these examples are areas that are beyond an operator’s control. However, there are opportunities when operating a restaurant, to win the margins battle. One area to manage, which may seem insignificant, but is a silent killer in business, is employee theft. The amount in the restaurant business stolen by employees is about $6 billion dollars annually. The percent of annual revenues lost to theft or fraud is 7%. Believe it or not, 75% of employees have stolen at least once from an employer and 35% have stolen at least twice. With these kinds of statistics, it is not only extremely important to be vigilant with all employees, but..."